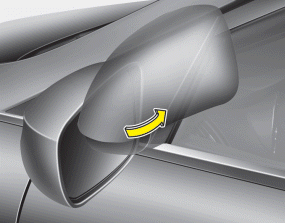 Your vehicle is equipped with both lefthand and right-hand outside rearview mirrors. The mirrors can be adjusted remotely with the remote switch. The mirror heads can be folded back to prevent damage during an automatic car wash or when passing in a narrow street. The electric remote control mirror switch allows you to adjust the position of the left and right outside rearview mirrors. To adjust the position of either mirror, the ignition switch should be in the ACC or ON position, or engine is running. 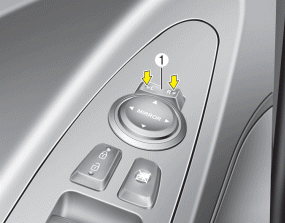 Push the switch (1) to R or L to select the right side mirror or the left side mirror, then press a corresponding point on the mirror adjustment control to position the selected mirror up, down, left or right. After the adjustment, put the switch into the neutral (center) position to prevent inadvertent adjustment. Do not attempt to adjust the outside rearview mirror by hand. Doing so may damage the mirror. To fold the outside rearview mirror, grasp the housing of the mirror. Lift slightly straight up, then rotate mirror towards the rear of the vehicle. These mirrors rotate on an upwards angle.